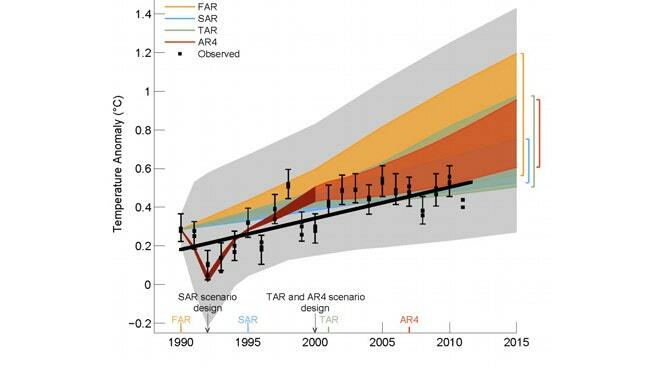 In this graph from the U.N.'s IPCC, colored areas show temperature predictions, the black dots are actual observed temperatures. The black line (added by FoxNews.com) shows overall temperature trends. “Their predictions have largely failed, four times in a row... what that means is that it&apos;s time for them to re-evaluate,” Spencer said. The IPCC graph shows that the midpoints of the various models predicted that the world would warm by between about 0.5 degrees Fahrenheit and 0.9 degrees Fahrenheit between 1990 and 2012. Actual warming was much less than that: 0.28 F, according the data the IPCC cites. But that doesn’t mean the IPCC models are wrong, others argue. “It’s important to keep in mind that there are natural short-term variations in global temperature that happen right alongside human-induced warming,” Aaron Huertas, of the Union of Concerned Scientists, told FoxNews.com. Other types of natural anomalies include solar variability and weather patterns such as the El Niño southern oscillation. Scientists include a “margin of error” in their models to account for unpredictable variations like volcanoes and weather patterns. Yet one of the IPCC’s models missed the actual warming trend entirely -- in other words, the actual temperatures were outside its “margin of error.” In the other three models, the actual warming trend fell within the very lower bounds of what they predicted would happen. At least that’s what the IPCC’s chart shows. One scientist who recently published a study that found that the IPCC predictions were very accurate argues that it is likely wrong. “The IPCC graph you refer to is just a draft version which still has a number of problems that will be ironed out,” Potsdam University physics professor Stefan Rahmstorf told FoxNews.com. Skeptics such as Spencer also say that the chart does not mean that global warming is a hoax. But he says it does indicate that greenhouse gases are having less of an affect on climate than the IPCC thought. “It is evidence that CO2 is not nearly as strong a climate driver as the IPCC has been assuming. This is the possibility they do not allow to be considered, because it would end all of their policy-changing goals,” he said.